Implementing a healthy China strategy, enhancing people's health and well-being, and taking advantage of the "health dividend" are related to the overall progress of society. 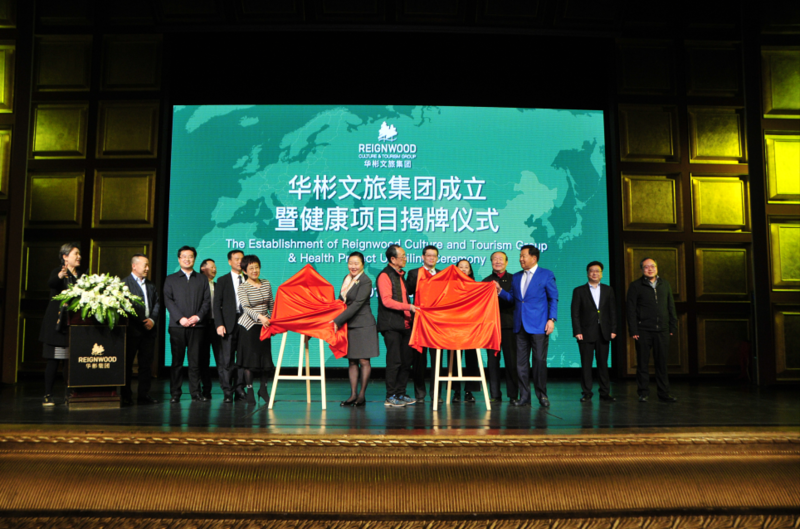 On April 10th, the unveiling ceremony of the establishment of Reignwood Culture and Tourism Group & Health Project was held in Reignwood Theatre. Mr. Yan Bin, Chairman of Reignwood Group, Professor Hu Dayi, internationally renowned cardiovascular expert, and his Doctors Group teams, Zhu Min, Vice Chairman of the World Anti-Aging Academy of Medicine and Chairman of the Asia Pacific Region, Guo Yi, Chairman of Greater China Area of the World Anti-Aging Academy of Medicine, Zhu Li, Vice president of Chinese Academy of Sports Science and other guests attended the event. Grasping the opportunity of the times, Reignwood Group, fully utilized the state's strategic support for the cultural tourism industry to integrate its resources and optimize its operation. Based on the green sector and focusing its business on culture and tourism, Reignwood Culture and Tourism Group was established. Hu Shuren, President of Reignwood Culture and Tourism Group, gave a briefing on the Organizational Structure of the Group. Hu Shuren said that under the guidance of the "Healthy China 2030" planning outline, Reignwood Culture and Tourism Group started a new chapter by joining hands with the World Anti-Aging Academy of Medicine and Hu Dayi Doctors Group, based on the green health industry resources. It aims to build a personalized and refined health management service system and comprehensive medical service platform. To optimize and integrate Reignwood's green health industry resources and upgrade Reignwood Health Management Service Platform, the unveiling ceremony of the World Anti-Aging Academy of Medicine Demonstration Base and the Hu Dayi Doctors Group Reignwood Office was held. Hu Dayi Doctors Group Reignwood Office is an integral part of Reignwood Culture and Tourism Group, covering six major health service projects including cardiovascular and psychological diagnosis, aerobic exercise capacity assessment and training, nutritional assessment and intervention, smoking cessation intervention, sleep monitoring assessment and intervention, external counterpulsation treatment. It also covers six types of services including health assessment and guidance for occupational population, population at risk of hypertension, diabetes, dyslipidemia, and atherosclerotic patients, rehabilitation assessment and guidance for patients suffering coronary heart diseases, patients having undergone operations of stent implantation or coronary artery bypass grafting, and patients with arrhythmia. "People's health is an important symbol of national thriving and prosperity." In the future, Reignwood Group will integrate advantageous resources to boost the development of green healthy industry and the Healthy China.